No longer the fifth wall.. Yesterday, ceilings inspired human kind and architects. Ceilings would be an architect's gateway to the heavens. Of course, back then, they had the space. Nevertheless, the perfect example is Jeronimos Monastery in Spain. 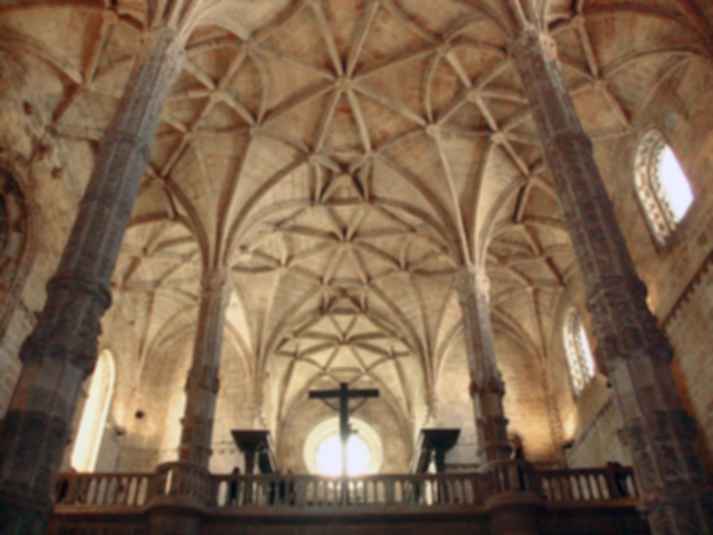 Their ribbed vaulted ceiling is reaching for the heavens. How could someone not look up and be in awe? The attention to detail is obsessively brilliant, and the octagonal pillars, alone, will certainly drop some people to their knees. Today, sometimes, ceilings are referred to as the fifth wall. So, how do architects, in today's world, inspire awe with ceilings? The canopy ceiling is fantastic for the connection of two parts. When done correctly, the two parts should have that look that they are soul mates, they belong together. The canopy at the Hoshakuji Station accomplished this feat. It made the connection from the west part of the railroad to the east part, effortless. They used a wood soffit, suspended on steel hangers, where they fluctuated the height of the canopy to create both an enclosed and lofty look and feel. Also, the pieces were disjointed and assembled like a puzzle to represent a fragmented society that was healing and being pulled back together. The canopy connected the east side to the railroad to the west side, effortlessly. Ceilings can have a function. With the famous BanQ restaurant in Boston, Massachusetts, they've used their canopy ceiling to hide some mechanical, plumbing and lighting systems of the restaurant. Brilliant. They're functional and they are beautiful, when done right. The sloped ceiling is very similar, in mood, to the ceiling at the Yale University Art Gallery. At the art gallery, the sun changes the shadows on the waffle-slab ceiling. It's moody. It also looks different from one side of the room to the other side. Afternoon looks and feels different from morning. The sloped ceiling is stealing that idea, because it isn't looking for that perfect 90-degree angle. It's searching to capture the sun at the right angle. It can make the space comfortable... or not. Dropped and false ceilings can be both functional and inspiring. They hide mistakes. They hide mechanical, electrical, and plumbing features easily. They can also be used to exaggerate a certain area with lighting or just with a clever design. Whatever the reasons; false ceiling, suspended ceiling, drop in ceiling, or dropped ceilings are a great tool for the architect. With the fight for space increasing, everywhere, ceilings still should not be an addendum. They still can be awe-inspiring and brilliant. They can hide mistakes, and they can be your fifth wall. Whatever your reasons, don't let them be an afterthought. What are some creative ways you've used the fifth wall?